A tree has collapsed and fallen out of The Dark Hedges, the line of trees in Northern Ireland made famous by its use in the drama series Game of Thrones. The avenue was used as the King’s Road in the second series of the programme. The beech tree fell over last week in a gale. It fell into a field and the owner has commissioned an auction company, Daniel McAlister & Son, from Cushendall, to sell the tree to the highest bidder. The tree will be advertised on the firm’s Facebook page and their website soon. There is an article in the Irish News, 1 February 2019, about the situation. The company website is here http://www.danielmcalisterandson.com/. I’ve not visited the trees, but the photographs in the article and Google Earth Streetview show a classic instance of a beech avenue. The mature beech trees are spaced approximately 10m apart with a small road between them. Many of the trees have been lost over the years and more look in poor condition. The sections that are most intact are definitely impressive. The newspaper article suggests the trees are around 200 years old, and on Streetview they do look of a size to make this a realistic estimate for the oldest of them. Beech trees of this age are definitely in the ‘veteran’ category, as their lifespan only rarely exceeds 300 years in UK. In my experience beeches that get to 250 years old are definitely getting close to their sell-by-date. Those trees that do reach that age have to be pretty tough, but they have also been around long enough for there to be lots of opportunities for pathogens and other organisms to be sharing their body and space. So management of such trees needs careful assessment. There is an interesting panorama of the Dark Hedges available on the 360 Cities site here https://www.360cities.net/ge_image/the-dark-hedges-on-the-bregagh-road-northern-ireland-uk?utm_source=google_earth&utm_medium=all_images . There is an impressive beech hedge in Scotland, the Meikleour Hedge, that looks more like a hedge than the gnarly avenue of the Dark Hedges. The Scottish hedge was planted in 1745, a notorious date in Scottish history when the Stuart uprising was crushed. The Meikleour Beech Hedges Wikipedia page is here https://en.wikipedia.org/wiki/Meikleour_Beech_Hedges. 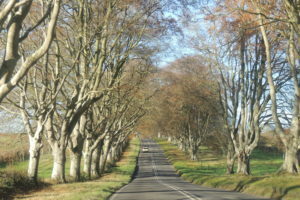 In Dorset there is a similar avenue to the Dark Hedges close to Badbury Rings, just north of Wimborne. This is double line of beech trees as well, with the road running between the lines. There are around 500 beech trees left of the original 731 that were planted in 1835. From photographs I’d say they are of a similar age to the Dark Hedges. The beeches provide a great spectacle in early spring as the leaves begin to open and in autumn as they turn a bronzy-gold colour. 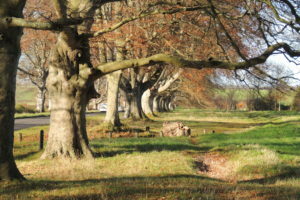 Here are a couple of photos of the beech tree avenue near Wimborne. In Britain we have a tremendous resource of big trees from our past. They are part of the treasure we pass on to the next generation. At Treecall Consulting we know about trees and can help with tree management, from veteran beech trees, like those in the Dark Hedges, to smaller, younger ones. Give us a call if you need us.